An Outside the Lines investigation of 10 major football and men’s basketball programs found that the University of Florida had the most athletes -- 80, or 24 percent of its rosters -- named as suspects in more than 100 crimes from 2009 to 2014. But along with having the most athletes involved in alleged crimes, Florida also had the most repeat offenders. Twenty-five Florida athletes had multiple run-ins with police, often without facing charges or any public airing of what they did. Several police reports gathered by Outside the Lines also revealed that Florida athletes, if not suspected of criminal activity themselves, often hung out with people who were known offenders. In one example that did not make Outside the Lines’ overall investigation, a Gainesville police officer stopped former Florida linebacker Ron Powell for a lane violation in 2014 -- just a few months after he had been drafted by the New Orleans Saints. The officer noted that the address on his driver’s license was a known drug house. A canine officer came to the scene and flagged a likely presence of narcotics in the car, and the investigating officer searched it, finding a white powdery substance on the driver’s seat that she tested on site. The car was a rental, and the officer wrote in a police report that she did not believe the cocaine was Powell’s but was likely tied to a known drug offender who lived at the same address. She let Powell go with a verbal warning for the lane violation. It was not Powell’s first incident with police. His other happened in October 2012, when he started yelling at and threatening the owner of a local store who wouldn’t give him items for free in addition to others he had planned to purchase. According to the report, the owner, Gregory Cristell, “stated Powell thinks just because he plays football for UF that he should get free stuff.” Police gave Powell a trespass warning and, even though the incident didn’t make news, police reported it directly to an athletic department administrator. Powell and his agent did not respond to requests for an interview. 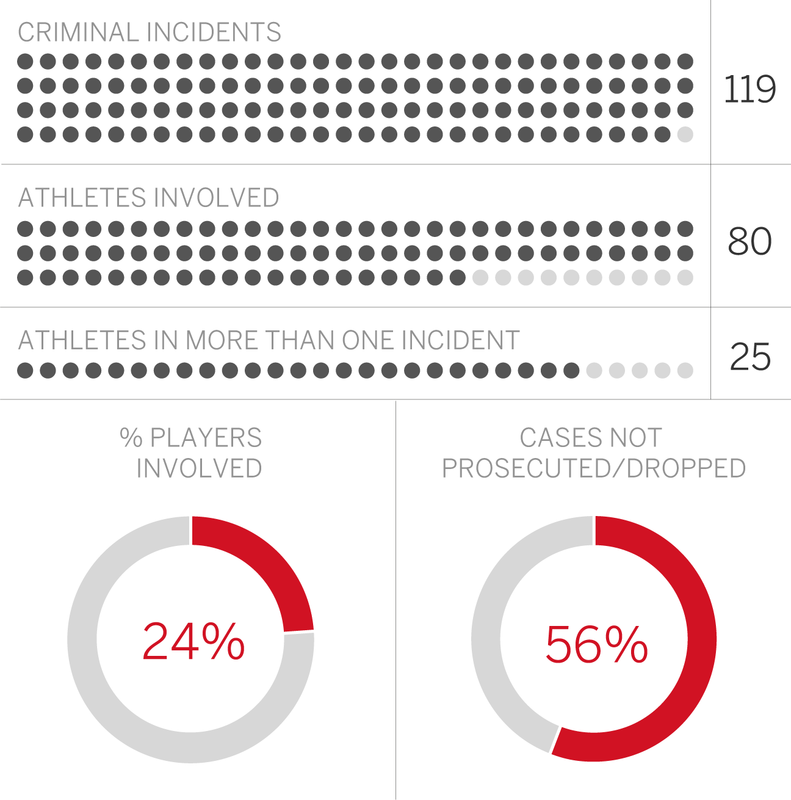 Overall, the Outside the Lines investigation found that what occurs between high-profile college athletes and law enforcement is not as simple as the commonly held perception that police and prosecutors simply show preferential treatment, though that does occur. Rather, the examination of more than 2,000 documents shows that athletes from the 10 schools mainly benefited from the confluence of factors that can be reality at major sports programs: the near-immediate access to high-profile attorneys, the intimidation that is felt by witnesses who accuse athletes, and the higher bar some criminal justice officials feel needs to be met in high-profile cases. An examination of more than 2,000 documents shows that college athletes accused of crimes mainly benefited from a confluence of factors that can be reality at major sports programs. The full report. In another Florida incident, on May 30, 2009, police arrested cornerback Janoris Jenkins for fighting and resisting arrest. An officer wrote that he saw a group of men fighting and yelled at them to stop, but they continued. He drew his Taser and fired at Jenkins after he saw him punch another man in the head. But Jenkins got up and ran away, ignoring commands to stop. Jenkins told police he was fighting because he thought someone was going to steal the gold chain around his neck, but the officer said he didn’t see anyone doing that. Jenkins’ attorney, Huntley Johnson, said at the time that Jenkins acted in self-defense and he expected the charges to be dismissed, which they were after he received deferred prosecution. On Jan. 22, 2011, police caught Jenkins smoking marijuana in the bathroom of a local nightclub. Jenkins pleaded no contest and the court withheld adjudication, which means he was not convicted. Three months later, police caught Jenkins smoking marijuana in a parked car. This time, he was kicked off the football team and would later be found guilty. In 2008, Moses Jenkins -- no relation to Janoris -- had a couple minor run-ins with police. He was cited for having a stolen parking decal, which was a common citation among athletes, and he was with a group of athletes whom police questioned about shooting fireworks at people, to which Florida running back Chris Rainey admitted responsibility. In July 2010, Jenkins and teammate Carl Moore were passengers in a car police stopped for having a dim tag light. A search of the vehicle uncovered a baggie of marijuana under Jenkins’ seat. The driver, Oscar Hernandez, told police the baggie was his and he was cited and received deferred prosecution. Hernandez was not an athlete, but his name would surface years later in connection to Aaron Hernandez, no family relation, the former New England Patriots star recently convicted in the murder of Odin Lloyd. Oscar Hernandez has been found guilty of having a role in delivering weapons to Aaron Hernandez and is facing federal charges of witness tampering, obstruction of justice and lying under oath, along with a history of other drug charges in Florida.